What’s the secret? As The Bee describes it, the Prego “bears 13 toppings above a thick crust, marinara sauce and melted mozzarella. Salami, pepperoni, sausage, ham, ground beef, mushrooms, Parmesan cheese, oregano, linguica, black olives, bell peppers and heaping handfuls of onions and minced garlic.” Or, just about every toping Skipolini’s has to offer. According to legend, a woman came in to the restaurant several years ago and asked for a pizza that would put her in labor. The pizza chefs got creative with a pie so loaded with toppings it weighed over 4 pounds. The woman’s water broke that night. Perhaps the baby was so overwhelmed by spicy sausage and cheese it wanted out of the womb? 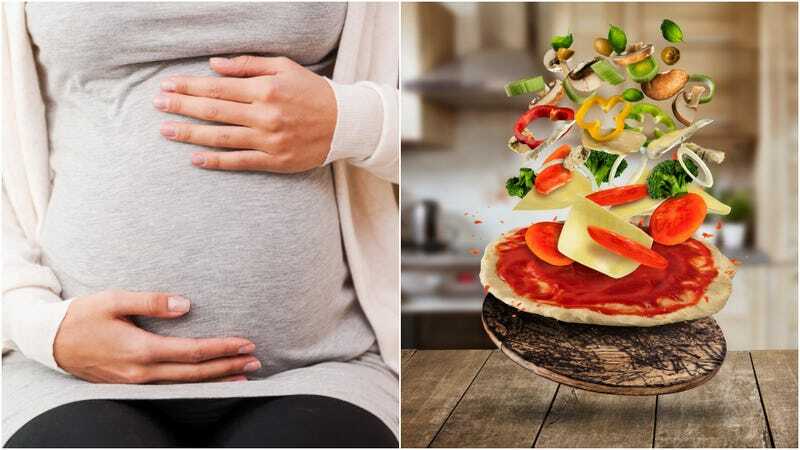 Since then, news of the Prego Pizza has spread widely on social and local media. Doubters just have to read one of the over 100 testimonials on Skipolini’s website, which include the resulting baby’s weight and name, and stories like, “I had tried everything the Dr had suggested to start labor… After eating the delicious pizza, we went home and turned on the TV. I didn’t feel any differently, so when my husband fell asleep on the couch and I took a shower. 30 minutes later my water broke!” (The baby’s name is Allison.) Or: “I even told a friend about it, and she also went into labor the next day. No complaints about a yummy birth inducing pizza.” True, too bad only the Bay Area is so lucky. Granted, there are a lot of other possible explanations at play here: Like coincidence (maybe those women would have gone into labor that night anyway? ), or power of suggestion. Or the fact that one pizzeria is attracting a high number of very pregnant customers. But as labor-inducing tips go, we would be much more inclined to go with a loaded pizza over castor oil. No word on how many babies in Northern California are now named Skip.